Sociology is one subject that has always smitten me. We as individuals, have our own beliefs, ideas, perceptions to the world around us, and to the society. Some of these are taught, some are learnt. All of us have some kind of social conditioning. We all have our own personalities. Religion is a powerful tool, in shaping personalities. So powerful, that it sometimes clouds our vision. It is such a touchy topic, that I usually avoid discussing it, at all costs. Most people (at least the ones I have met) aren’t able to discuss the ‘philosophy’ behind their religion. Most aren’t even interested in knowing about another religion or what it says. I follow Hinduism. However, I have read the Bible (having studied in a Christian college) as well as the translation of the message of the Koran. I have also studied the message of Buddhism. I do not claim to be an expert at all. There is so much more to learn. Every religion has so much to teach.No religion is superior or better than the other. Personally, I find the philosophy in the Bhagavad Gita (a holy book of the Hindus, originally in Sanskrit, dating back to 300 or 400 BC) very useful. 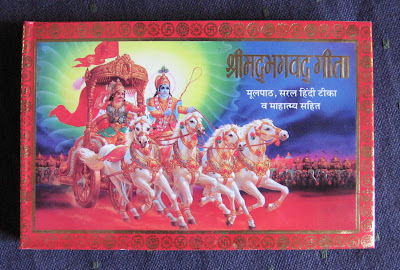 The Bhagavad Gita is the essence of the Vedas and Upanishads. 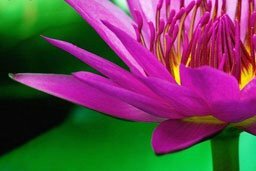 It is a universal scripture applicable to people of all temperaments, for all times. It is a book with powerful thoughts and practical instructions. The Bhagavad Gita has influenced many great thinkers over the years. Whatever happened, happened for the good; whatever is happening, is happening for the good; whatever will happen, will also happen for the good only. You need not have any regrets for the past. You need not worry for the future. The present is happening. This body is not yours, neither are you of the body. The body is made of fire, water, air, earth and ether, and will disappear into these elements. But the soul is permanent - so, who are you? Dame's diary: Oh yes it is profound.But very meaningful.After all when we die what do we take with us? hey, thanks for the geetha summary. it was a nice read. Two things absolutely leapt out at me from this: 'The present is happening' adn 'change is the law of the Universe'. Ain't that the truth! It makes sense to me - after all we were all start dust once! I know what you mena about discussing religion. It is very hard to discuss the philosophy without people getting heated about what is right and wrong. A shame as we can all learn so much from each other. I love learning about other religions. I don't have one but I was raised as a Catholic, so like you mentioned, I find myself having catholic thoughts, almost unconsciously. All in all, we're only trying to gain some comfort and some meaning through religion, whichever we choose or follow, but I agree that there is much to be learnt from studying these old pieces of wisdom, with an open-mind, no clouded judgement. I am amazed that even today we shy away from discussing our faith and traditon..I suppose there are so many who are biggoted and will never consider that another's faith is also right. I find it ludicrous that even among my own countrymen the consideration is that if you're born in England, then you are a Christian. It makes no sense...living in a garage does not mean you are a car. Thank you for widening my outlook! Diya:Thanks for reading. My pleasure. Bob-Kat:Very true. Personally I find the lines "Whatever happened, happened for the good; whatever is happening, is happening for the good; whatever will happen, will also happen for the good only. You need not have any regrets for the past. You need not worry for the future. The present is happening." very inspiring. Niall:You put it so aptly! I did not know about that England bit. DM:thanks! This is so much deeper han what i usually post--but somehow I wanted to say it!. Freelance:I always feel that Hinduism is NOT a religion.It is a way of life. (Therefore I cannot 'convert' into Hinduism.That concept of 'conversion' does not exist at all) Personally I love the philosophy and the message. geeta is a play of words!! philosophically thinkin it makes all the sense the world!! but its real world application is limited, but it can be a tremendous tool to apply for situations wen u r relly bogged down!! I find that we share some common interests as i discover you more through your posts. ***All of us have some kind of social conditioning. We all have our own personalities. :) I really like the fact that we all do have our own personalities. Makes the world a little more interesting i would say. ***Religion is a powerful tool, in shaping personalities. So powerful, that it sometimes clouds our vision. Abhinav: That way philosophy itself, is a play of words--don't you think? One thing is true that u dont take anything with you when u leave this world.That itself gobsmacks so powerfully. To be absolutely honest I am an athiest. So, won't be able to comment. Kulpreet: Yes--you may be an aethist.But then philosophy is something else! Its not that I believe in after life and such.But one thing that strikes me is that most people dont realise how transient material wealth is.To each his own I suppose! i am not very religious.. but yes "Bhagwad Geeta" is one of the most amazingly intelligent book i've read. totally.. just has answer to almost everything! Though i dont know if religion now days is such a powerful tool in anyone's social conditioning.. have to think abt that! Ankit: Oh yes--The philosophy of your religion does condition you, and you dont even realise it.For instance, presuming you are a Hindu,will you stamp or step on a picture depicting Ganesha? I believe in a God...or else how can intelligent creatures exist on Earth? where did they come from? I will save it up for sometime later. Vik:its ok--you can tell me what you think.I'm not convinced that easily though! Abhishek;Thanks for book marking me!